Discover out-of-the-way places like Botanical Park & Gardens Of Crete and Chania Venetian Lighthouse. You'll find plenty of places to visit near Chania Town: Speed Boats Tours (in Falassarna), Horseback Riding Tours (in Platanias), Cretan Traditional Cooking Lessons (in Kissamos) and Fisika (in Kolymbari). There's much more to do: choose your vessel at Captain Nick's Glass Bottom Boat Aphrodite, look for all kinds of wild species at Topolia Gorge, glide through the air with a parasailing or paragliding tour, and explore the different monuments and memorials at German War Cemetery. For photos, ratings, other places to visit, and tourist information, read Chania Town travel itinerary creator. Phoenix, USA to Chania Town is an approximately 23.5-hour flight. The time zone difference moving from Mountain Standard Time to Eastern European Time is 9 hours. Prepare for little chillier weather when traveling from Phoenix in April: high temperatures in Chania Town hover around 69°F and lows are around 54°F. Cap off your sightseeing on the 16th (Sun) early enough to go by car to Heraklion. Explore hidden gems such as Cretaquarium Thalassocosmos and Stalis Beach. Venture out of the city with trips to Lychnostatis Open Air Museum (in Hersonissos), Hantra (in Analipsi), Lake Voulismeni (in Agios Nikolaos) and Safaris (in Malia). Next up on the itinerary: steep yourself in history at The Palace of Knossos, admire nature's wide array of creatures at Aquaworld Aquarium & Reptile Rescue Centre, pause for some serene contemplation at Church of Saint Titus, and admire the local landmark of Morosini Fountain (Lion's Fountain). For where to stay, other places to visit, maps, and other tourist information, read our Heraklion trip builder. You can drive from Chania Town to Heraklion in 2 hours. Other options are to drive; or take a bus. 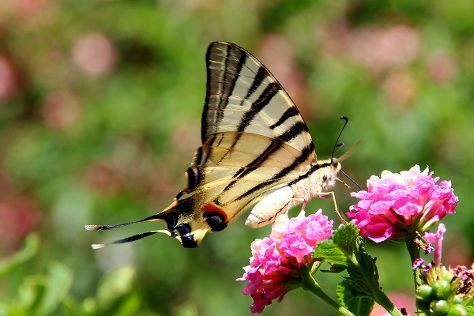 April in Heraklion sees daily highs of 68°F and lows of 54°F at night. Finish up your sightseeing early on the 19th (Wed) so you can travel to Matala. A low-key tourist resort known for its ancient cliffside caves, Matala boasts a rich history that spans over 2,000 years. On the 20th (Thu), tour the pleasant surroundings at Red Sand Beach (Kokkini Ammos), then view the masterpieces at MoozArt - Wood Art Workshop, then look for gifts at Goods of the Ground, and finally tour the pleasant surroundings at Matala beach. Get ready for a full day of sightseeing on the 21st (Fri): look for gifts at Botano Cretan Mountain Herbs, then relax in the rural setting at Agia Marina Donkey Rescue Sanctuary, then take in the spiritual surroundings of Monastery Panagia Kaliviani, and finally explore the ancient world of Ancient City of Phaistos. To see where to stay, traveler tips, reviews, and other tourist information, refer to the Matala travel itinerary planner. Traveling by car from Heraklion to Matala takes 1.5 hours. 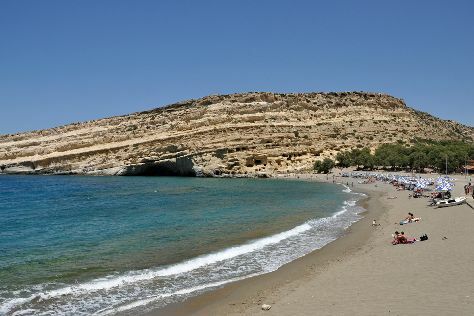 April in Matala sees daily highs of 68°F and lows of 54°F at night. 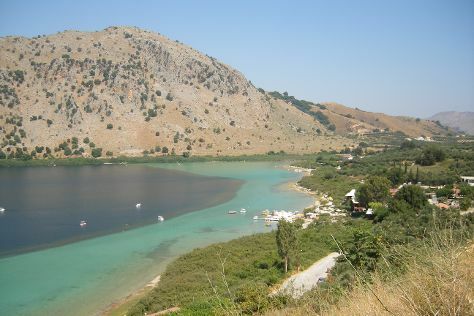 Wrap up your sightseeing on the 22nd (Sat) to allow time to travel to Kournas. On the 22nd (Sat), contemplate the waterfront views at Lake Kournas, then take a stroll through Rethymnon Old Town, then get a taste of the local shopping with Cretan Lyra Workshop - Museum Stagakis, and finally contemplate in the serene atmosphere at Sacred Monastery of Arkadi. On your second day here, identify plant and animal life at Biotopoi Nature Park, then admire the local landmark of Rimondi Fountain, and then look for gifts at Feel Silver Jewelry stores. To find traveler tips, photos, where to stay, and more tourist information, read Kournas online itinerary creator. Traveling by car from Matala to Kournas takes 2 hours. In April, daytime highs in Kournas are 68°F, while nighttime lows are 54°F. Cap off your sightseeing on the 23rd (Sun) early enough to travel back home.